"Casablanca", starring Humphrey Bogart and Ingrid Bergman, won the Oscar for "Best Picture" at the 16th Annual Academy Awards. The movie also took home the prize for Best Director (Michael Curtiz) and Best Screenplay. Even though Humphrey Bogart was nominated as Best Actor for his portrayal of Rick - a cynical but good-hearted American who runs a café in unoccupied Africa during the early days of World War II, the award went to Paul Lukas for his role in "Watch on the Rhine" (a movie I've got to say I've never heard of!). Bogart eventually went on to win an Oscar for his role "The African Queen" playing opposite the legendary Katherine Hepburn but it took until the 20th of March 1952 for that to happen. By that time, the other significant event to happen in Southern California on March 2nd, 1944 had already turned eight years old and was probably soaking up knowledge, good books, and imaginative radio shows like a proverbial sponge - all things that would eventually lead to her 40-year career as a writer/editor. With a self-proclaimed "insatiable curiosity combined with a love of travel, a voracious appetite for books, and a compulsion to pursue historical trivia", she's also the writer of one of the best blogs (in my own humble opinion) out there! Please join me in wishing a very happy birthday or - as the Scottish say it - Co`latha breith sona dhuibh! to Jamie of Duward Discussion as she celebrates the 65th anniversary of her date of birth. Jamie, may your Haggis plate always be empty and your whiskey glass always be full! You're truly a classic and will only get better with time! Speaking of classics, in Texas there are another couple of ladies celebrating their birthdays today, too. Mighty Mom of My Wonderful Life and her darling daughter, Sugars, are 34 and 2 respectively sharing their March 2nd birthday. 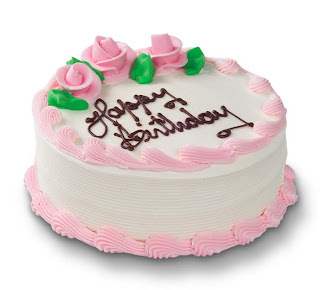 Rumor has it the girls like pink so in their honor I present to them a pink birthday cake and many happy returns of the day! Happy birthday to Jamie, Sarah, and Sugars - may you all have a year filled with blessings and happiness! What a wonderful tribute to Jamie - a wonderful lady and blogger. Very nice post, Linda. I also wish her a happy b'day on my blog. Happy Birthday to Sarah and Sugars also! May all 3 have days full of joy... and CAKE!! Happy Birthday to them all. I see I have something in common with Mighty Mom..giving birth to our daughters on our birthdays. Bogart certainly should have won the Oscar there. Happy Birthday to all concerned. wow - and I thought your birthday tribute to me was nice! I want you to write my obit, ok? Happy Birthday to the Birthday Babes! that cake is just beautiful!! reminds me of the ones my mom made waaaaaaaaaaaaaaay back when!!!! You are an incredibly talented laday and deserve all the good things life brings. One cute quote I got: "The Germans wore greay. You wore diapers."